Factory Outlet Tooling . (FOTCNC) is a leading industrial manufacturing tool distributor for metalworkers, aerospace, oil & gas, automotive, and job shop manufacturing. Headquartered in Richardson Texas, FOT assists corporations in reducing their component costs, purchasing costs, shipping costs, delivery times, and expenditure accounts. We focus on improving every process in a company from all phases of manufacturing. FOT hand selects the highest performing product lines, tests those products, and trains on them; We then educate our customers on the newest technology so they can stay at the forefront of our industry. Established in 2004, FOT has over 81 years combined experience in industrial manufacturing. With access to all major cutting tool manufacturers needed for milling, parting & grooving, turning, threading, and holemaking; FOT has the cutting tools for your job. FOT supplies band saws, boring bars, burrs, carbide inserts, drills, end mills, face mills, hand tools, inspection tooling, measuring tools, reamers, safety, shop supplies, taps, threading dies, tool holders, workholding tools and more to metal workers. Working with our local, national, and global business partners for many years, FOT understands your project and knows the tools you need to get it done. Factory Outlet Tooling offers Managed Inventory and Inventory on Demand (IOD) for customers working on a “just in time” (JIT) program. This task is accomplished through inventory on assignment at site locations, utilization of FOT warehouses, as well as manufacturer allocated inventory. FOT works with corporations in the reduction of waste and cost with improved use of your system applications. 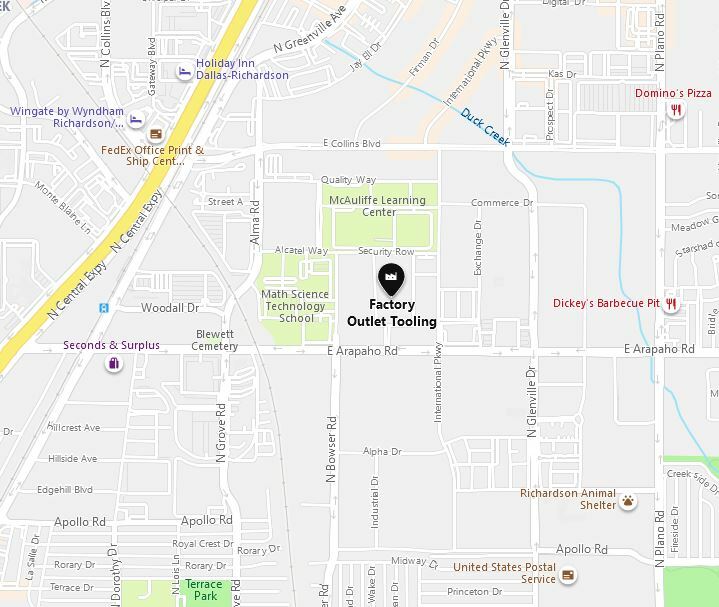 Factory Outlet Tooling is located in Richardson, convenient to the DFW metroplex.